BLACKSBURG, VA. - No. 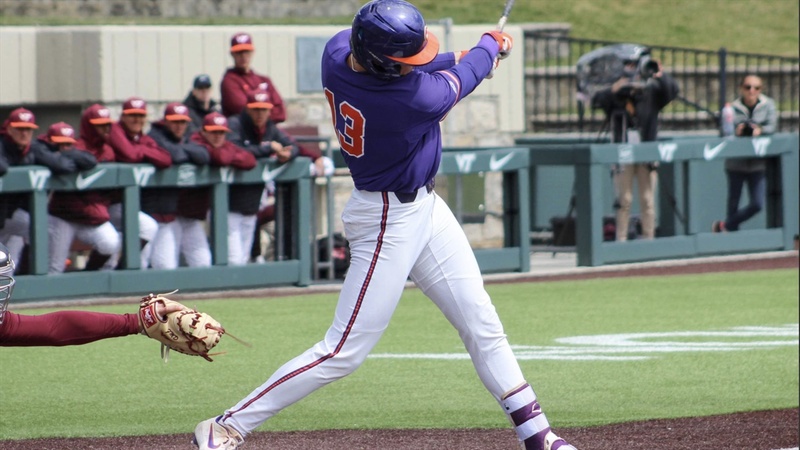 15 Clemson scored six runs in the first inning and added five runs in the seventh inning after the Hokies rallied to within a run in its 12-9 victory over Virginia Tech at Union Park on Sunday afternoon. The Tigers, who swept the series 3-0, improved to 22-6 overall and 9-3 in the ACC. The Hokies fell to 16-12 overall and 4-8 in ACC play. The Tigers scored six runs in the first inning on Bryar Hawkins two-run single, Bo Majkowski's run-scoring double and Bryce Teodosio's three-run homer, his eighth of the season. After Kyle Wilkie lofted a sacrifice fly in the second inning to give Clemson a 7-0 lead, the Hokies scored two unearned runs in the third inning without a hit, three runs in the fourth inning and a run in the fifth inning to narrow Clemson's lead to 7-6. Clemson finally responded with five runs in the seventh inning. Wilkie and Grayson Byrd hit run-scoring singles, then Clemson scored three runs on an errant throw to first base. Kerry Carpenter belted a two-run homer in the eighth inning. All nine Tiger starters had at least one hit, as Clemson had 13 hits in the game. Tiger reliever Holt Jones (2-0) earned the win, as he allowed four hits, two runs and one walk with four strikeouts in 3.0 innings pitched. Hokie starter Jack Dellinger (1-3) suffered the loss, as he gave up six runs on five hits in 0.2 innings pitched. The Tigers host Georgia at Doug Kingsmore Stadium on Tuesday at 6 p.m. on ACC Network Extra.